I got this book about 2 years ago, but I never have a chance to taste any recipes.The pound cake with whipping cream in the ingredient, sound good to me. Why I wait for 2 years I really don’t know. 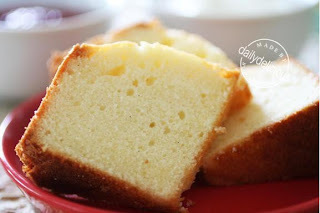 This pound cake is very good or I can call it the best one, the crumb is fine, the texture is very good and the smell is heavenly. But I didn’t make the cake without adaptation; I scale down the recipe so there are some points that I had to change. First of all this recipe is only 1/3 of the original recipe (and I feel sorry that I make a small size of this great cake), second I omit the almond extract and the third I add a vanilla bean in. 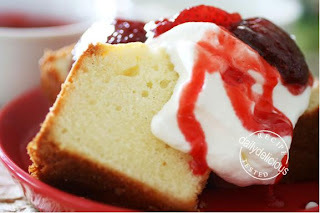 This cake can be served on its own, but with a tangy and sweet taste of strawberry sauce to accompany, this cake is divine. 1. Position a rack in the center of the oven and preheat the oven to 325°F. Grease the inside of a 7 inch Bundt cake pan. 2. Sift together the flour, baking powder, and salt into a medium bowl. Whisk to combine, and set aside. Mix seed scrapings from ½ vanilla bean with sugar, set aside. 3. In the bowl of an electric mixer, using the paddle attachment, beat the butter at medium speed until very creamy, about 3 minutes. Add the sugar in four additions, beating for 1 minute after each one, or until light. Beat in the eggs one at a time, beating for30 seconds after each addition and scraping down the sides of the bowl with a rubber spatula as necessary. Beat in the vanilla extract. 4. At low speed, beat in the flour mixture in three additions, alternating it with the cream in two additions; scrape down the sides of the bowl thoroughly after each addition. Beat for 30 to 45 seconds longer. Scrape the batter evenly into the prepared pan. 5. Bake the cake for 45 to 50 minutes, or until it is golden on top and a toothpick inserted in the center comes our clean; the cake should pull away slightly from the sides of the pan. Cool the cake in the pan on a rack for 10 to 12 minutes. 6. Carefully invert the cake onto another rack and let cool completely. 7. Serve with whipping cream and Easy Strawberry Sauce .